Katie Brown, O.D. examines Mack Farris' eye. It is a refreshing outlet for the Farrises because they spent 18 months in a dark bedroom. Mack Farris’ vision had been severely damaged in a workplace accident in 2016. After multi-disciplinary care at the UAMS Harvey & Bernice Jones Eye Institute, Farris can now see well enough to work, drive, read and travel. “In the last visit we had with Dr. [Christopher] Westfall he said, ‘I want you all to take a trip. And I want you to see things.’ So we went home. And that’s what we did. We saw things,” Karen Farris said. Christopher Westfall, M.D., professor and chair of the Department of Ophthalmology . On Aug. 12, 2016, there was a clogged drain in the warehouse at Mack Farris’ workplace. It was not an unusual event. It happened from time to time. And like he normally would, Farris used a drain cleaner product to clear the pipes. But on this particular Friday morning, the drain was more clogged than usual. Farris says the fluid went through his nose and in his eyes, blinding him. The next thing he remembers is being in a trauma center in Fort Smith. They were just about to fly him via helicopter to Little Rock. But doctors warned the pressure change would not be good for his eyes. Mack Farris says he knew he was being well taken care of. He just couldn’t see anything. Katie Brown, O.D. and John Pemberton, O.D discuss treatment options for a patient. The alkali burn caused Farris to lose vision completely in his left eye. The vision in his right eye was too fuzzy for him to function as a sighted person. In April 2017, Farris received a cornea transplant for his right eye. Later, John Pemberton, O.D., associate professor of the Department of Ophthalmology in the UAMS College of Medicine, surgically repositioned Farris’ eyelids and the surface tissue to prevent further damage that could lead to infection and loss of the eyes. Pemberton says an alkali burn is generally more severe than an acid burn because it tends to burn longer. For his left eye, which shrunk and lost vision, Pemberton placed a thin prosthetic shell over the white of his eye, or the sclera. The scleral shell gave Farris’ face a more symmetrical balance. Brown prepares to insert scleral contact lens in Mack Farris’ right eye. While Farris was healing, the light bothered him. His family had covered his bedroom windows with garbage bags to block the sun. Karen Farris says their son Daniel, who was living in Fort Smith at the time, helped them a lot. They took advantage of grocery store pickups and meal kit services. While in their house, Farris says she and her husband would imagine places they would go when he healed and regained his sight. “We’d dream of taking down the garbage bags and putting in French doors. We’d talk about taking trips,” Karen Farris said. Before the accident, Mack Farris enjoyed outdoor activities and keeping up with his four grandchildren. Caden is 12, Cash and Kenadie are 11 and Isla is 2. His wife says he wasn’t as active when he couldn’t see. Daily phone conversations with his sister, Cindy Hall, in Alabama and babysitting Isla were some of the many things that kept his spirits up. Karen Farris said they laughed often and reminisced about good times over the 29-year marriage and raising three sons. Hall and her husband, Larry, even traveled from Eldridge, Alabama, to Little Rock and Fort Smith for every procedure and surgery. Sometimes, they’d come by just to lift their spirits. “They were a huge support to us,” Karen Farris said. 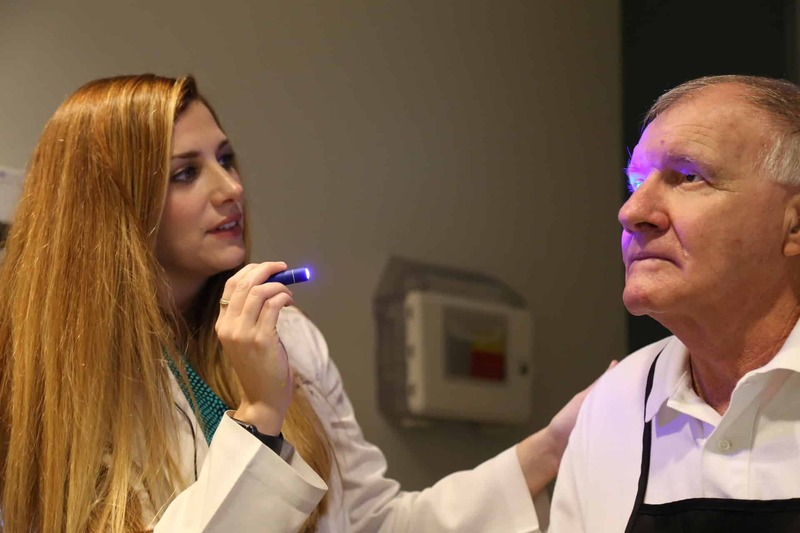 Katie Brown, O.D., an optometric physician in the Jones Eye Institute, saw Farris for the first time in March 2018. She was set to fit him for a scleral contact lens in his right eye. Unlike most contact lenses, scleral contact lenses are firm and are able to hold a small reservoir of liquid. It covers the cornea and much of the sclera. On the day of Farris’ appointment to get his scleral lens, he could hardly make out the big ‘E’ on the eye chart. Mack and Karen Farris visit the beach. Everyone in the exam room was emotional. It had been 586 days since Farris lost his vision. Karen Farris documented much of their journey and clinic visits with photos and video. She compiled a video montage that included images from his first day in the hospital until the day he received his contact. The video shows ophthalmic tech Leora Bibbs crying and embracing Farris. Karen Farris says off camera, “We love you too, Leora. We couldn’t have gone through this without you.” The montage includes photos of Mack Farris smiling and posing with Westfall, Brown and Pemberton. Karen and Mack Farris have taken down the garbage sacks in this bedroom. They now have French doors. Farris has returned to work, something many of his coworkers never expected to happen. He’s been reissued a driver’s license.